Frankly, this is a lot of trouble to make -- so much chopping, peeling, etc. However, I end up making it all the time, either to satisfy my own craving or that of my family and friends. 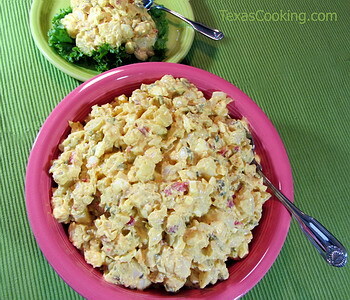 To me, this is the ultimate in southern potato salad. My mother always used Miracle Whip in this recipe; however, as you will see, I recognize that there are Miracle Whip people and mayonnaise people, and either may be used to achieve a spectacular result. Boil until potatoes are tender when pierced with a fork. Do not overcook -- potatoes should not be mushy. Peel and dice the cooked potatoes. Mix together the Miracle Whip, mustard and vinegar, and stir until smooth. Pour mixture over the chopped vegetables and gently fold (or mix with your hands) to coat. Note: This recipe makes a veritable vat of potato salad, enough for a large gathering. It is easily halved if you are serving a smaller group, but way too much trouble for only a few. It does, however, make great leftovers if refrigerated. And, speaking of refrigeration, if you take this salad to an outdoor gathering, be sure to keep it on ice until serving time.